It's a tough pool Canada are in with Fiji, Spain and France - any of those teams can create the upset if Canada aren't on form. Canada finished 3rd in Glendale, the USA were surprise performers coming second while Australia ended up a disappointing 5th. Both teams are best to be avoided at Dubai in the pool rounds. New Zealand won the tournament. The tournament kicks off tonight, officially tomorrow at 12:22am PT and is streamed live on CBC Sports. West coasters are less likely to catch the 3:18am match versus Spain but early risers may fit in the 6:15am vs France. The men's tournament starts Friday. DUBAI, UAE (November 19, 2018) – Head Coach John Tait has announced the 13 players who will travel to Dubai this week for the second round of the HSBC Women’s World Rugby Sevens Series next weekend. Coming off a third-place finish in the Glendale, Colorado last month, the roster remains unchanged with the same 13 players travelling to the next round. Veteran Ghislaine Landry made history in Glendale, becoming the first-ever female player to record 1,000 points in the World Rugby Sevens Series. Teammates Charity Williams and Bianca Farella also had stand out performances, scoring 4 and 5 tries respectively. Sitting in pool C, the women will face off against Fiji and Spain before playing France who currently sit fourth in the world rankings. 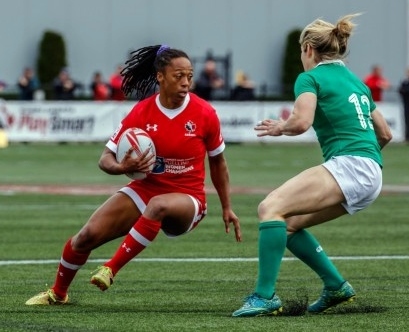 Canada had a stellar performance against France in the Glendale Series bronze medal match, claiming victory 28-0. Williams and Kaili Lukan both got on the board scoring one a piece, with Farella notching two tries in the uncontested performance. Every win on the Sevens Series is vital as the ladies continue their pursuit for Tokyo 2020 qualification. With an Olympic bronze medal under their belt, the team looks to utilize their seasoned veterans who know how to perform on the big stage. 6. Bianca Farella, Town of Mount Royal RCF (Montreal, QC) ? 7. Julia Greenshields, Sarnia Saints (Sarnia, ON) ? 9. Ghislaine Landry,Captain, Toronto Scottish (Toronto, ON) ?